This glass vase was made in the 17th or 18th century in Iran. It has a delicate applied glass rope ornament at the base of the neck, and is intricately decorated with gold enamel in a diamond and star pattern. The vase was free-blown, which means that it was produced without the use of a mold, and by blowing into a heated iron blow-pipe until the desired shape, thickness, and size was achieved. 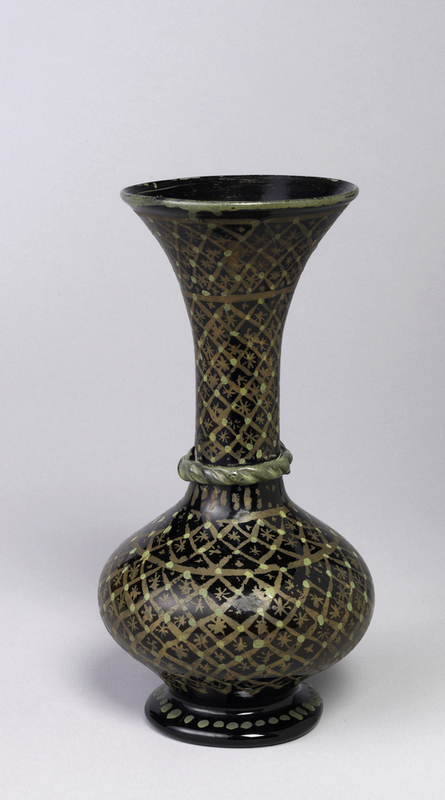 This classically-inspired decanter shape was common in Islamic glass at the time. However, we can surmise that this object was a luxury item, given the elaborate enameling. Enameling is an ancient technique that was practiced in Rome, and was transferred to Persia by 350 AD, when political power shifted from Rome to Constantinople. Enameling requires the use of finely powdered metallic pigments, which are applied to the glass with the assistance of a fluxing substance and oil or water. It is delicate work, and it is time consuming, as the glass has to be re-heated after the enamel has been applied, to ensure that it adheres to the glass surface. Notwithstanding its ancient history, enameling only became frequently used in the late Islamic period of the 13th and 14th centuries, when it was reserved for luxury items and large lamps for mosques. Indeed, some of the best known examples of gilding and enameling in Islamic glass are the mosque lamps intended to hang from the ceilings of holy places, decorated with abstract patterns, arabesques, and quotations from the Koran, which confirms the special status accorded to enameled glass at that time. ← Dutch Clouds or Color Icons?